· This was the most difficult cover, and the background changed many times whilst I was painting. 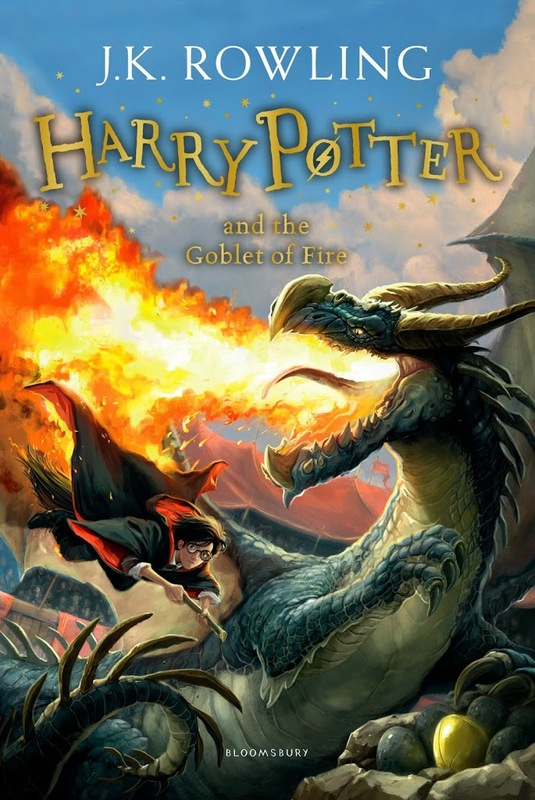 · I meant to paint Harry’s torn robe, but I forgot all about it whilst struggling with the dragon and background, and only remembered after the artwork had gone to print. · In the finished artwork, there was a big section of the dragon’s wing above the flames, but it made the titles difficult to read, so was painted out. Some of this can be seen in the beautiful gif Bloomsbury sent over. I love seeing the progression of the cover and seeing more into how harry came to life for it. In 1999 I graduated from college, moved across the country, and got a job in a bookstore in the space of about two weeks. Yes, I was a little overwhelmed. As part of my training at the store, they encouraged me to familiarize myself with the current bestsellers. The manager pointed to Harry Potter and the Philosopher’s Stone and Harry Potter and the Chamber of Secrets. But that didn’t even begin to describe what I found in Harry Potter. I felt like I’d found a book written just for me. I felt like it was Christmas and Halloween all at once. I felt like I was home, surrounded by friends and family. I’ve never encountered characters that felt so real, a world so magical yet believable, or stories so engaging. Will anything ever be better than Harry? Does it matter? I love to reread favorite books, but Harry Potter is the only series where reading it for the fifth/eighth/tenth time still makes you feel as wonderful as the first time. I was around 13, my sister was going off to university soon and she could not stop raving about these silly books about wizards and the fact that they were turning them into films. I didn’t see the appeal, but she wouldn’t stop reading them. Finally the time came to say goodbye and she went off, packed up for uni all the way down in Norwich – which is a long way from the North East village we grew up in. But with her farewell she promised a visit; if I read the first Harry Potter book she would let me go and visit her in halls that November, and take me to see the film. Knowing she would hold on to that promise only once she knew I read the book I decided to read it, begrudgingly. That begrudge only lasted a couple of pages and once Hagrid had knocked down that door and muttered ‘Sorry ’bout that’ I couldn’t stop reading. I was hooked. I begged for the next books and impressed my sister when I went to visit. I loved the film (at the time, now I cringe whenever its on, they are just so young!) and from there my love for this fandom grew and grew. I’m now the proud owner of multiple Harry Potter editions, have fan t-shirts and declare myself a proud Hufflepuff at any given moment… I even have my very own Marauder’s Map! I love everything about the world and don’t think the books will ever grow old for me. Thank you JK Rowling for writing something I am so passionate about!